Film Review: ‘5 Flights Up’! 5 Flights Up hits and misses, and yet in the end, still manages to leave you somewhat satisfied. It’s the story of an aging couple, struggling to make their home for the last forty years grow with them as they deal with the issues age brings. Their Brooklyn apartment is, as you may have guessed, 5 flights up, which poses a problem for both their aging bodies, and, their dog, Dorothy, who is having problems walking. And so, the film takes us on a whirlwind journey of to sell or not to sell, to give in to the changes taking place outside their door, or settle in and be comfortable with what they love: each other. 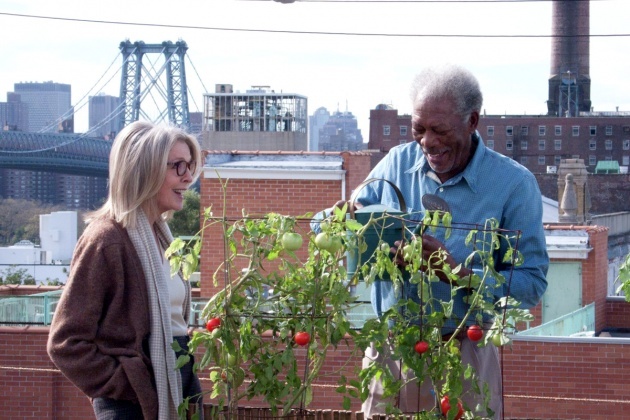 Diane Keaton and Morgan Freeman play Ruth and Alex Carver. Their performances are the glue that holds the film together. They depict an inter-racial couple that married and moved to Brooklyn when it wasn’t trending. Through a series of flashbacks you get to see that their relationship has withstood not only time, but critics, prejudice and professional hardships. The film’s focus is the couple’s decision to sell their place or stay put, but in addition to this, the film has two sub-plots that are intermingled. The five flights pose a problem for Alex as well as their aging dog, Dorothy. At the beginning of the film, Dorothy experiences a major health hurdle and has to go in for emergency surgery. The couple decides that they will do whatever it takes to save Dorothy, but her fate remains up in the air during the chaotic showing of their home. Additionally, there is a captivating news story about a Muslim man who has abandoned a truck on the Brooklyn Bridge… and a manhunt ensues. This story, and the hunt for a possible terrorist, partially paralyzes the city, which isn’t good news for the real estate market. The frustrating thing about this film is that the story is a new one, but the way it plays out is in no way realistic. The theater was packed with an audience of middle aged to older people who were ready to see a film, with incredible talent, that they would relate to. I can’t speak as an older person, but I think that it’s fair to say that when you start having trouble walking up stairs, you don’t choose to walk five flights up just because you like the place. And while older people can be cantankerous, stubborn and resistant to change, another message this film delivered is that they would do anything for their pet. Perhaps they would have decided to stay for them, but never for Dorothy. If you go see ‘5 Flights Up‘, go for the acting. Keaton, Freeman, and Cynthia Nixon as their niece are all performances I enjoyed. The supporting cast is filled with people you will recognize from other films or bit parts and they bring humor, sweetness and a sense of reality to an otherwise irrational film. This entry was posted on Sunday, April 12th, 2015 at 5:35 pm	and is filed under Film, News. You can follow any responses to this entry through the RSS 2.0 feed. You can skip to the end and leave a response. Pinging is currently not allowed. « Film Review: ‘Don’t Look in the Basement 2’!